The long-awaited 38th annual Deltek A/E Clarity report is now available! For those of you who are unaware, each year Deltek performs a detailed Architecture & Engineering Industry study. It is the lengthiest and most thorough study in the industry. 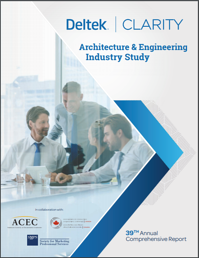 Using the A/E Clarity report results, Deltek is able to offer firms unique insights into the AEC industry. More than 550 firms across the United States and Canada participated in this year’s study. About 25% of participants were from architecture firms, nearly 60% from engineering firms, and the final 15% represented all others. The size of participating firms ranged from small firms with 0-50 employees to large firms with 251 employees or more. Although this year’s report shows that firms continue to remain solid financially, they must continue to focus on project management procedures so that projects are kept on time and on budget while meeting the expectations of their clients. With business development, firms must be constantly looking ahead at where their next projects will come from, what they look like, and how they will be achieved. Additionally, firms must continue to advance their efforts in talent management to find, hire and retain the best of the best. Using the A/E Clarity Report results, you can now compare your firm’s data, not only to your firm’s previous year, but also to the data of hundreds of other firms in the same field. This report offers significant insights to help you visualize where your firm is today and assist you in developing goals and a plan for the future. For an in-depth view of everything included in the Deltek A/E Clarity report, download your copy today.